Unlike the Greek settlers before them, the ancient Romans made themselves much more comfortable on the island. Of course it helps that they owned the mainland – Dalmatia was a Roman province, with a large city at Salona, on the sheltered northern harbour of today’s Split. The modern city of Split started life as the retirement palace of the Emperor Diocletian, who was born in Dalmatia. But back to the island. The Romans, then, having pushed out the Greeks in 219 BC had a relatively peaceful and prosperous existence on Hvar. They called the island Faria, and set about improving the agriculture, most notably the wine production. They dismantled the defensive walls at Faros, but presumably the merchants and traders continued business as usual. There was apparently a settlement in Vrboska, but the map isn’t precise enough for me to tell exactly where it was. Would be interesting to know! It’s a lovely harbour, and perfect place for a villa, if you’re not worried about invading hordes from the sea. No, I’m not talking about today’s yacht marina and excursion boat traffic, but attacking pirates and Illyrian resistance to the Pax Romana! Whereas the Greek farmers had only small shelters in the fields, the Romans constructed more spacious villas with room for managers, slaves and livestock. 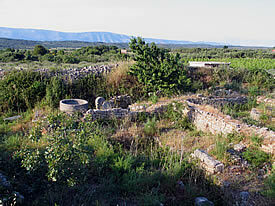 The best known villa rustica on Hvar is Kupinovik on the Stari Grad Plain close to Stari Grad. 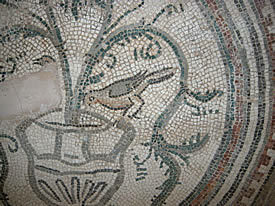 Excavations show the extent of the buildings, the olive press and other signs of the ancient agriculture. You can imagine these ancient Roman landowners coming over for the summer season. Strolling around in their tunics and sandals, bathing in the sea, going for walks, admiring the Greek ruins, etc. The Stari Grad fields continued to be cultivated, property was expanded and the island was exporting wines and olive oil, just like today. The Stari Grad Museum has a beautiful display of underwater archaeology- the cargo of a Roman shipwreck laid out like it was still on the seafloor. The galley sank in the Duboka cove on the north side of Hvar island near Basina, in the mid 4th century. 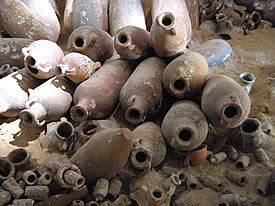 You can see all the amphora strewn around – this was a serious export business! But what of the Illyrians? As they didn’t write things down, the end of their story is not entirely clear. I assume they got assimilated into the Roman Empire one way or another.